There's something special about Max. He may look like your regular ginger flabby tabby, but unlike most tabbies, he can actually communicate with his human, reporter for the Hampton Cove Gazette Odelia Poole. 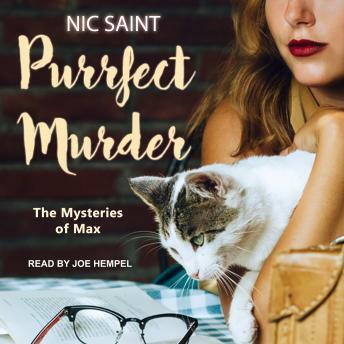 Max takes a keen interest in the goings-on in their small town, by snooping around with his best friends Dooley, a not-too-bright ragamuffin, and Harriet, a gorgeous white Persian. Their regular visits to the police station, the barbershop and the doctor's office provide them with those precious and exclusive scoops that have made Odelia the number one reporter in town. But when suddenly the body of a bestselling writer is discovered buried in the last Long Island outhouse, and a new policeman arrives in town to solve the murder, it looks like things are about to change in Hampton Cove. Detective Chase Kingsley doesn't take kindly to nosy reporters like Odelia snooping around his crime scene or interviewing his suspects. And to make matters worse, he's got a cat of his own in Brutus, a buff, black bully, who, just like his owner, likes to lay down the law. Soon Brutus isn't just restricting access to the police station, but he's putting the moves on Harriet, breaking up the band.